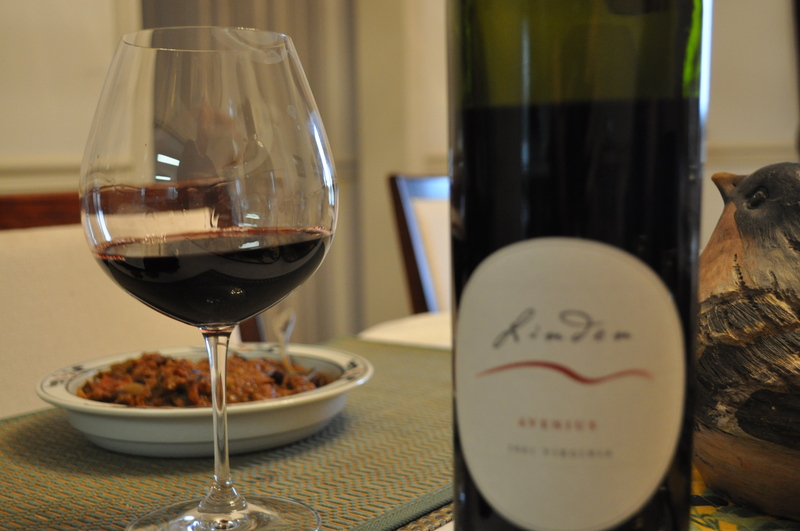 Wine with chili. 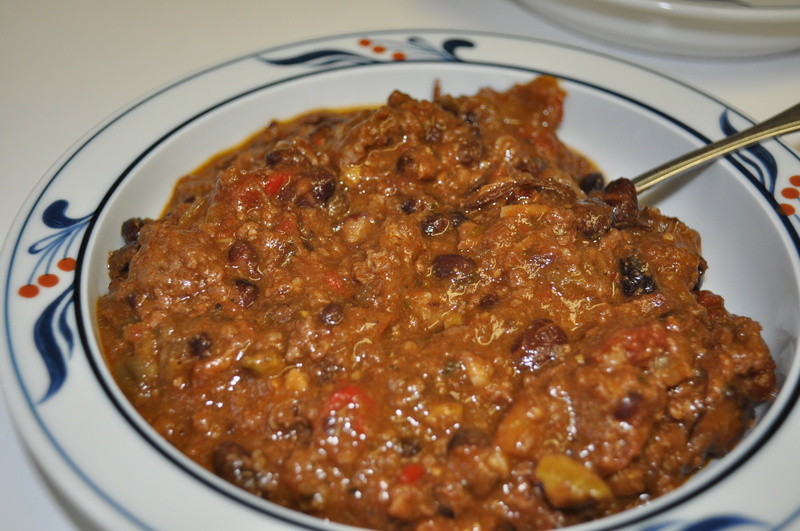 Only a real win if the chili is subtle, smoky, with cinnamon undertones. Not the “In Your Face” heat. Sunday is the day the Eat Local All Winter group posts what we made using locally sourced items. After a wonderful day hiking and discovering new things at the Conservancy with Tom Wessels, it was nice to come home to a warming meal, chili. 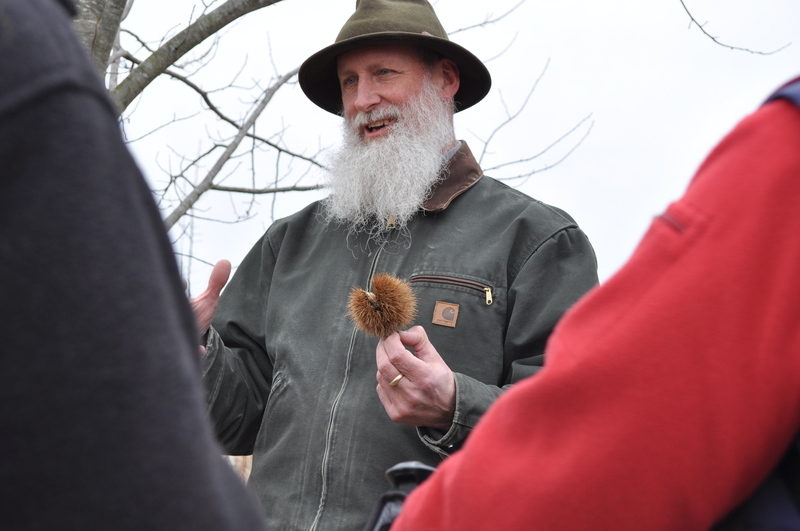 Did you know we have young American chestnut trees surviving the blight, although they are fighting it, on the property in Woodstock? 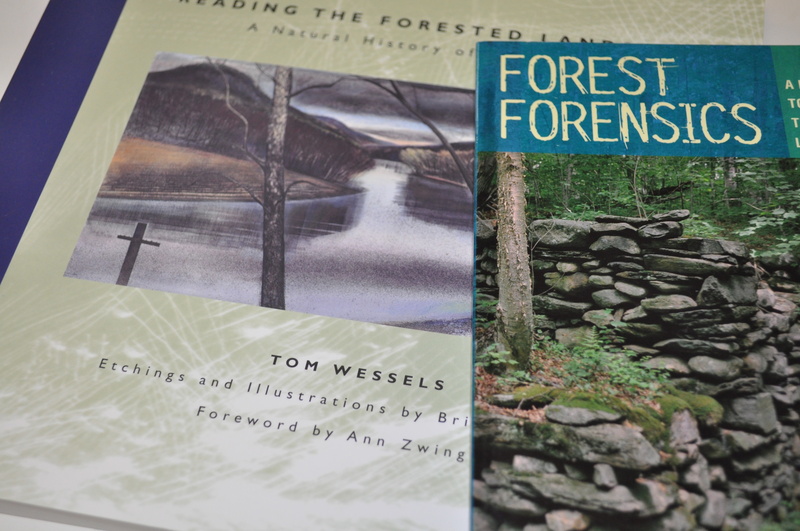 We found many interesting items today, and have the opportunity to learn more from the books about reading the forested landscape. I will save more details about what we learned for a future post, and get back to the other topic, What was dinner? The vast majority of the chili came from our freezer. It included a large container of heirloom tomatoes from my garden, onions and peppers from the CSA, and a beef stew stock made last fall. All dumped in the crock pot with a pound of the ground venison. Additional tomato paste, black beans and tomato/lime/cilantro mix (courtesy of Rotel) came from the pantry and weren’t local. Also, a couple of onions from last week’s CSA delivery, chopped up. The spices were cinnamon, chili powder, garlic powder, salt and pepper. A splash of Pennsylvania maple syrup, and a chopped up jalapeno out of the freezer, another CSA contribution. Slow cooked for ten hours in the crock pot. It looked like this when done. 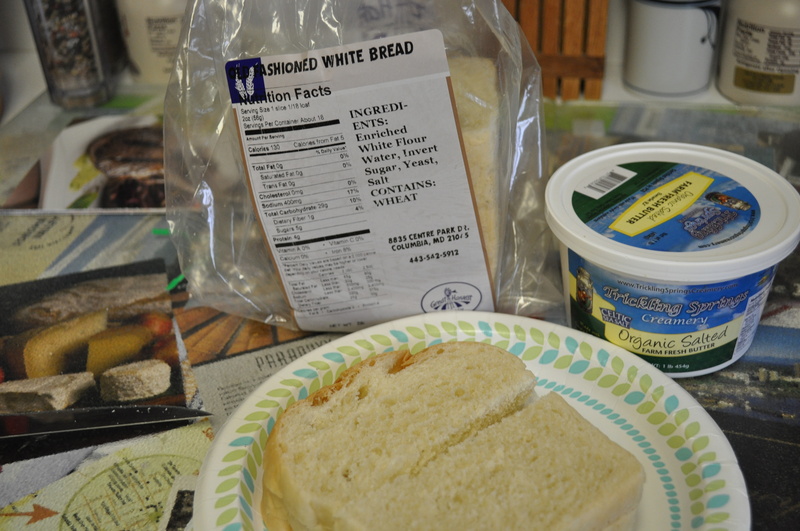 Served on the side were Trickling Springs butter and that old fashioned white bread from Great Harvest. Since it didn’t overwhelm with heat, and had lovely flavor, I decided to open a VA wine. An old one. Predominantly petit verdot. A grape used sparingly in France in Bordeaux, but one which does well in the long growing season in VA. 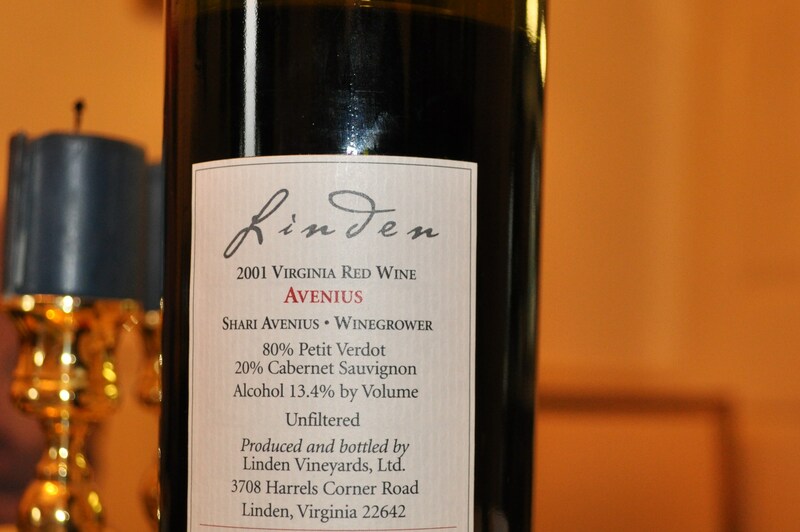 Yes, the year is 2001, a very good year for VA wines. This blend is vastly different than the other three blends Linden produced in 2001. With all of them in the cellar, we get to sample the differences. This wine has softened over the years, but is still lovely. Supposed to be past its prime, but we don’t think so. Cherry and tobacco in the taste. Very easy to drink. Not brown around the edges either. We do need to drink the rest of these though, as they won’t hold many more years. Later tonight, a bit of maple flavored yogurt from Pequea Valley Farm in PA, mixed with some blueberries from Butler Orchards, out of the freezer. Lots of berries left, and the yogurt is one I have talked about many times, available at Breezy Willow or at England Acres. I have to admit again, eating locally in the winter is not difficult around here. Posted in CSA, Farmer's Markets, Food, Howard County, Local Businesses, Locavore, Nature, Real Food, Volunteering, West HoCo, Wine, Winter Eat Local and tagged cooking, crock pot cooking, CSA, farmer's markets, Food, foodie, Howard County, howard county conservancy, Linden Vineyards, local businesses, Locavore, West HoCo, wine. Bookmark the permalink. We have about two dozen more packages of venison, some steaks, roasts, stew meat, ground and a tenderloin, still in the freezer. We paid to process one of the young does a neighbor hunted on a nearby farm. Our neighbors try and keep the herds under control. Some bring it all home, some have a list of friends with freezers, some donate to the food bank. Our deer population here is out of control in some areas. Bow hunting allows us to keep our flowers, veggie gardens, young trees and farm fields from being devastated.